Reviewed as download from hyperion-records.co.uk (available on CD and in mp3, 16- and 24-bit lossless downloads, all with pdf booklet). Sample track included on free Hyperion July 2015 sampler. The Gurre-Lieder offer a refreshing reminder of Schoenberg’s early style, a real contrast to the music we normally associate with this composer. Begun in 1900, with Verklärte Nacht and a few other post-Romantic works behind him, the work was composed under the influence of the music of Wagner, Strauss and Mahler. Even the text is Wagnerian in mood, based on the mediaeval saga of the 12th century Waldemar the First. However, it was not completed until 1911, as Schoenberg had to abandon it for long periods owing to the necessity of earning a living by orchestrating operettas. By 1911 the composer had become well-known as a modernist and so the first performance audience were surprised to hear a richly orchestrated piece of great romanticism. The Gürzenich Orchestra has a long and illustrious history and its fine quality makes an impact right from the start. Their performance of the opening Prelude is characterised by a sense of great delicacy combined with subtlety of phrasing, colour and mood-setting. Schoenberg leads us straight into Waldemar’s first song in which he sings of the peace and happiness he feels in his sorrow-free state and his love of nature. Brandon Jovanovich is an excellent choice for this role, entering the atmospheric mood already created by conductor and orchestra. His voice is most attractive in all registers, well-blended and with perfect intonation. As we move into the third and fourth songs, Marcus Stenz captures the dramatic changes in mood with fast and exciting music as Waldemar travels to meet Tove at the castle of Gurre. Jovanovich portrays the passionate texts and music superbly and he is well-supported by magnificent orchestral playing. The fifth and sixth songs depict the lovers’ meeting and in this love music we hear some of the most beautiful passages in Schoenberg’s score. There are outstanding orchestral solos which contribute to the texture, notably from clarinet and violin, and then a rather foreboding cello passage leads us into the seventh song. Jovanovich depicts the text very impressively, with real passion. His sense of horror and his fears for the future are apparent as he realises that he and Tove must surely be parted. But then Tove answers him in rapturous tones that they will find their true love and peace at last in death. Of course this is all very reminiscent of Wagner’s Tristan und Isolde, and Barbara Haveman has a soprano voice of truly Wagnerian proportions. She has immense power when needed as well as delicacy and subtlety of phrasing and expression. I do find that her voice has rather too much vibrato at times, but she portrays her part magnificently and is a musician of the highest order. Once again we hear outstanding orchestral playing in the Interlude leading to the Song of the Wood Dove in which the drama is magnificently conceived by Markus Stenz. He and his orchestra bring the song to a shattering climax with the realisation that Tove’s death has been caused by jealous Queen Helwig; the whole narrative is superbly realised by mezzo-soprano Claudia Mahnke. Another outstanding performance comes from Gerhard Siegel as Klaus-Narr, Waldemar’s court jester. His crazy ramblings provide for a synthesis of humorous and grotesque music, aided and abetted by further virtuosic, well-rounded and balanced playing from the Cologne players. Finally we come to what Schoenberg calls The Summer Wind’s Wild Hunt (Melodrama). Johannes Martin Kränzle takes the speaker’s role in yet another outstanding performance, this time in sprechstimme. Further glory must be credited to the combined choirs who conclude the work as Waldemar and Tove are reunited and the sun rises on a new world. 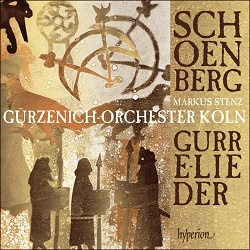 For me the stars of this recording are Jovanevich, Siegel and Kränzle, the conductor Markus Stenz, the Gurzenich-Orchester Köln and the combined choirs, but all the soloists are excellent. Hyperion’s recording is of a very high standard and copes magnificently with the vast forces involved. It is also worth mentioning the informative and well-written programme notes by Julian Johnson. This new performance is up there with several great recordings already in the catalogue. Schoenberg’s Gurre-Lieder may have been Romanticism’s last hurrah, but what a send-off it turned out to be. Originally begun in 1900 as a song-cycle for soprano, tenor and piano, the piece was completed too late for entry into the Wiener Tonkünstler-Verein competition for which it was intended. The composer decided to flesh out the work over the next three years, but then shelved it until 1910. The orchestration was completed in 1911 and the premiere took place two years later. Based on the Danish legend of King Valdemar’s love for his mistress Tove, who is then murdered by his jealous Queen, Gurre-Lieder is typically Romantic in its commingling of love and death; set in a darkly fantastical milieu it’s scored for a very large orchestra, chorus and five soloists. I first came to the piece via Seiji Ozawa’s 1979 Boston account for Philips; apart from being one of the conductor’s most memorable recordings it also boasts Jessye Norman as a thrilling, creamy-toned Tove. Since then I’ve come to admire Riccardo Chailly’s 1985 recording (Decca) and, most recently, Michael Gielen’s 2006 set for Hänssler. I know Markus Stenz via his Mahler cycle for Oehms; alas, I found it lightweight and just couldn’t engage with it on any level. The Gürzenich orchestra, though, have given me great pleasure over the years. I must single out their Tchaikovsky, Manfred in particular, and their epic traversal of the Shostakovich symphonies, both directed by Dmitri Kitaienko. It’s good to see them back in harness in this new Gurre-Lieder, along with the city of Cologne’s finest choirs. The Dutch chorus and Stenz’s soloists are all unfamiliar to me, which actually added to – rather than detracted from – my sense of anticipation as I pressed Play. Stenz’s Prelude, which starts well enough, is brisk and clear-eyed; Ozawa is much more sensuous – Debussian in fact – and with him one is soon drawn into Schoenberg’s seductive sound world. Stenz’s tenor Brandon Jovanovich is a decent Waldemar, but even at this stage it’s clear he’s no match for the wonderfully lyrical Siegfried Jerusalem (Chailly) or the characteristically rough but oddly compelling James McCracken (Ozawa). And although Barbara Haveman’s Tove is agile, she doesn’t shade her delivery – or float those high notes – as well as her finest rivals. Hyperion’s recording is clear, but it seems rather shallow compared with, say, the depth and reach of Hänssler’s for Gielen. In Ozawa’s hands in particular Part 1 unfolds with an operatic opulence, its yearning rimed with unmistakable foreboding; under Stenz I sense very little of that, or the long, seamless narrative that Gurre-Lieder requires if it’s not to resemble a string of discrete tableaux. Indeed, Stenz seems almost prosaic in this most poetic of settings. True, he does make the most of Schoenberg’s majestic tuttis, but without that essential ‘connectedness’ they don’t come across as the dramatic nodes they undoubtedly are. As if that weren’t disappointment enough I find Stenz’s soloists rather lacking in charisma. Jovanovich’s Du wunderliche Tove! (Wonderful Tove!) could certainly do with more weight and nuance, but Claudia Mahnke’s Tauben von Gurre! (Song of the wood dove) is most feelingly done. Ozawa’s Tatiana Troyanos is firm and characterful, and Chailly’s Brigitte Fassbaender is a tad squally at times, but at least they have the operatic mien that the part surely demands. Indeed, it’s that ‘voice acting’, born of years in the opera house, that makes Jerusalem so magnetic, even unassailable, as Waldemar. Chailly’s fine recording is not as immersive as Ozawa’s, but then his reading tends to be leaner and more explicit anyway. The dark colours of Part 2 are well caught in Stenz’s performance, but I simply can’t shake the feeling that the conductor is skating through the score, its manifold delights barely acknowledged in the process. Even when it comes to rhythmic felicities – one of Gielen’s many strong points – don't count for much when Stenz presses on regardless. Surely the supernatural elements of Part 3 – with its resurrected armies – should be more gripping than they are here? Ozawa, Chailly and Gielen all bring a thrust and thrill to this section that Stenz can’t quite manage. The choral contributions are excellent though, despite being chivvied along at times. I’ve seldom been disappointed by Gurre-Lieder, either on record or in the concert hall. I’ve very positive memories of Simon Rattle at the Royal Festival Hall and Pierre Boulez at the BBC Proms; indeed, the latter’s European Youth players – the subterranean brass in particular – were intensely theatrical in Part 3. Also at the Proms some years later Donald Runnicles fielded a fine team of soloists, including the late, great Hans Hotter as Klaus-Narr. As with the recordings mentioned here those live performances were delivered with real flair and a sure sense of drama. Admittedly that degree of involvement is hard – but not impossible – to achieve in a recording. That said, all three of the rival versions of Gurre-Lieder mentioned here come tantalisingly close at times. Alas, I can’t say the same about Stenz, whose finale encapsulates the shortcomings of his performance as a whole; it's outwardly impressive and his clown, Gerhard Siegel, is decent enough, but that powerful sense of cumulation – of long-delayed release – just isn’t there for me. Indeed, I’ve seldom felt so like a dispassionate observer at this point, and that’s certainly not what I want – or expect – from my Gurre-Lieder. For sheer magic – in every sense of the word – Ozawa is still hard to beat; that said, Chailly boasts the incomparable Jerusalem, and although Gielen’s soloists are somewhat variable he has the most spectacular sonics. In short, all three conductors convey the ineffable spirit of this piece in a way that Stenz doesn’t. It’s a shame, as his orchestra and choruses acquit themselves so well. As for Hyperion’s recording, that’s also a let-down; Philips’ ageing but still sumptuous sound stands up surprisingly well against the competition. Disappoints at every turn; older rivals still hold sway.